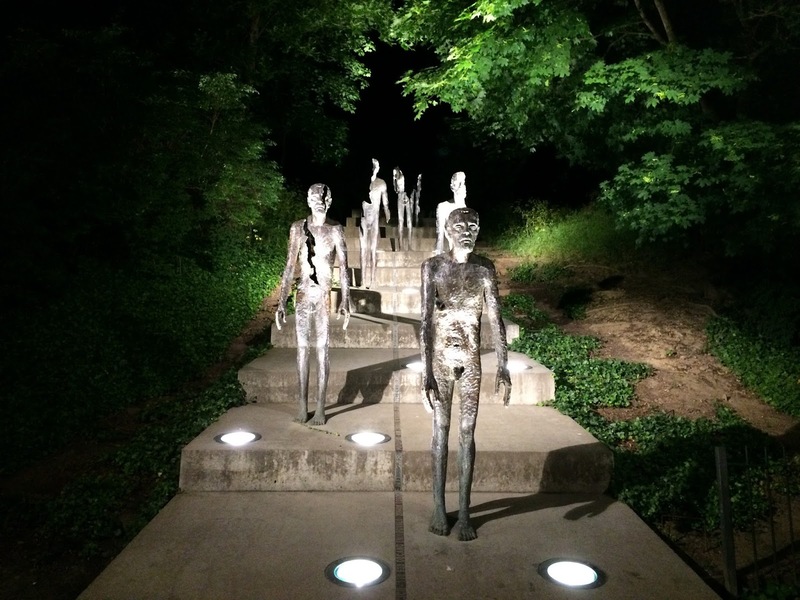 The above sculpture located at the foot of Petrin hill in Ujezd, is a memorial to victims of communism. I had created this image of Prague in my head, one that was straight out of a spoiled princess story book or movie. In that, the weather would be perfect, the lawns would be manicured, an assortment of food served on a silver platter, the chauffeur who holds the door open for you, a butler at your service and the subjects would be respectful and well mannered(yes, most of this is cinematic exaggeration). But you get the point-that I had a very moony image of Prague. How in reality, it was quite the opposite! We did not fly into the city in a private chopper. We arrived by train and as we exited the train station and made our way to the tram line, we got an eerie feeling.. It felt like some eyes were on us. We even hesitated to turn and look why we felt unsafe. There were quite a few homeless people. Some crippled. There was one guy who got up from a bench and followed us to the tram line in broad daylight. We just did not make eye contact for a while and ignored the guy. Just hopped on, into a tram. Once inside the tram, we sighed a breath of relief. We took seats in different ends of the tram. Probably I was letting off an air of being a simpleton. The guy in front of me picked up on that and started scamming me to get me to exchange Euros to Crowns. V intruded and that was that! The same evening we went to the clock tower and bought a snack of potatoes and cabbages at the old town square, that seems to be the staple. I noticed that, as people are enjoying their snacks, there are prying eyes, those of homeless people who are interested in the plates with leftovers that you drop into the bins. They do not mean any harm to you. Just that someone looking at you while you eat, makes you feel uncomfortable. And there are hawkers on the streets late at nights near wenceslas square and its surroundings trying to sell you drugs. To add to the fear which had built up inside me, there was a ruckus one morning just outside our hotel, where a duo was caught red handed by plain clothes police for robbing from tourists. There was a constant feeling of adventure, specially late evenings as the crowd on streets dimmed and while we were still out trying to satiate V’s desire for fun. Having witnessed all the above unsettling incidents, I did indeed feel fear. But recollecting those now, it feels only like adventure. Over the course of 4 days spent there, I realized that there was nothing to worry about. It was mostly due to my own undue expectations, that I felt what I did. Most cities, even my own, has an element of danger. But with time, you slide into ease. You start enjoying the imperfections of a city. It did take time for me to realize that I was not a princess and this was not a fairy land.. And while that happened, it was time to leave and that left me in tears. For I wanted to walk the charles bridge a little longer. Pingback: What I wore in Europe/how to pack for mixed weather – this and that I fancy..